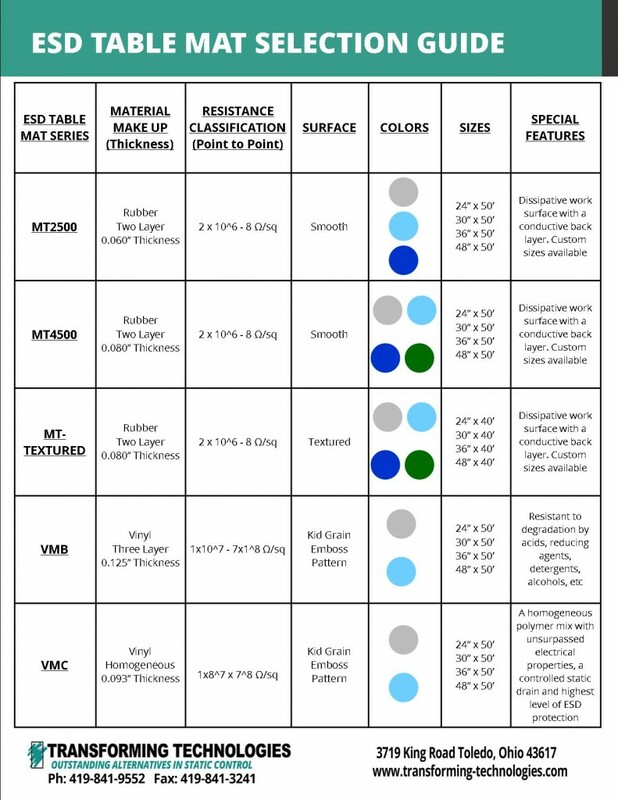 Transforming Technologies, a supplier of a wide range of ESD products, has added the StaticCareTMGL2500 Series ESD Cut Gloves to their line of ESD Apparel. Transforming Technologies, a supplier of a wide range of critically important ionization, matting, grounding, test equipment and ESD apparel for protecting static sensitive electronics, has added the Staticare™ GL2500 Series ESD Cut Gloves to their line of high-quality ESD Apparel. The Staticare™ GL2500 Series ESD Cut Gloves combine powerful cut resistance, comfort, and uniform ESD protection into one superior performing glove. 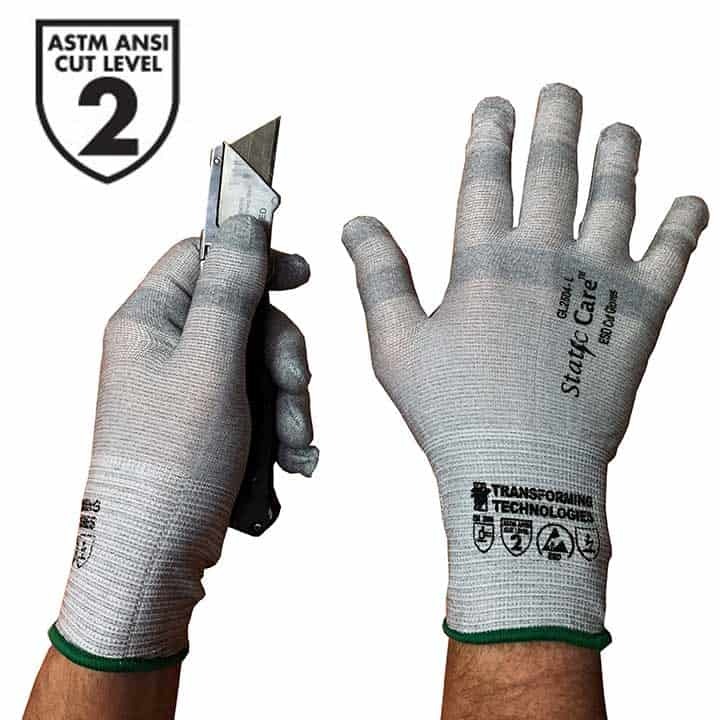 The gloves are certified ANSI Cut Level 2 while maintaining softness, flexibility, and comfort. The Staticare™ ESD Cut Gloves are constructed with 18-gauge Ultra High Molecular Weight Polyethylene (UHMWPE) thread which provides great cut protection, outstanding abrasion and tear resistance. 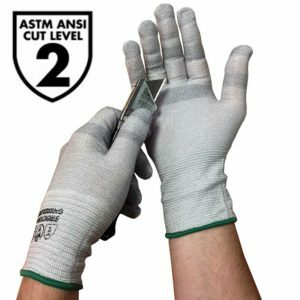 The gloves are rated ANSI Cut Level 2, which offers a basic level protection against cuts or punctures. Headquartered in Toledo, OH, USA, Transforming Technologies offers a wide range of critically important ESD products for protecting static sensitive electronics. Our products are key tools used by industries to assure an effective static control program. Transforming Technologies is pleased to announce the appointment of Michael Guild of Guild Manufacturing Solutions as the Independent Manufacture’s Representative for Florida. Michael Guild has over 20 years experience serving the electronics industry in Florida. Guild joins a group of independent sales representatives guided by Roger Chinn, Transforming Technologies Eastern Regional Sales Manager. Michael Guild can be reached directly at mike.guild@att.net or 407-808-3631. BEMCOT M-3 static dissipative cleanroom ESD wipers are suitable for nearly all manufacturing and optical cleaning applications. 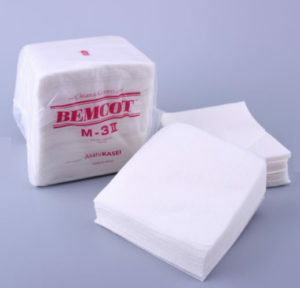 Bemcot wipers are for quick and easy wiping in cleanrooms, automotive manufacturing, electronics screen printing and other working environments that dem and the lowest levels of lint and particles. BEMCOT is characterized by its low particle generation, high absorbency, high purity, high chemical resistance, high heat resistance, anti-static, ecoefficiency, enabling the high level of performance required for wipers for cleanrooms. Read about Bemcot Wipers in Electronics Screen Printing and Bemcot Wipers in Automotive Processes. For price and availability on the BEMCOT M-3 wipers or for information on any products in Transforming Technologies full line of ESD products, please call 419-841-9552 or email info@transforming-technologies.com. 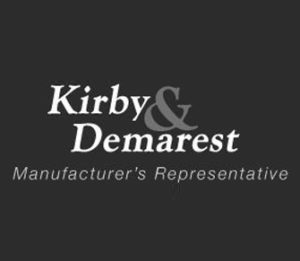 Transforming Technologies is pleased to announce the appointment of Kirby & Dermarest as the Independent Manufacture’s Representative for Oregon, Washington and British Columbia, Canada. Kirby & Dermarest is a team composed of Steve Kirby covering Oregon and SW Washington and Alan Siebenthall covering Washington and British Columbia, Canada. As a Manufacturers Representatives, Kirby & Dermarest bring to high technology companies an array of products utilized in the design, manufacture and test of circuit board assemblies, hybrid circuits, and semiconductors. There are THREE types of Static Control Garments that are compliant to the ANSI/ESD S20.20-2014 Standards. These smocks are primarily designed to shield the technician’s clothing from the ESD Sensitive product. They DO NOT come with a ground snap and DO NOT require a ground cord. When these static control garments come into contact with the users skin (the user’s skin is about as electrically conductive as the garment) the static charge is equalized and goes to ground via the technician’s primary ground source (normally an ESD wrist strap and or ESD heel grounders). These smocks are primarily designed to shield the technician’s clothing from the ESD Sensitive product but they also provide redundant protection in the unusual event the smock does not make contact with the users skin. The ESD smock has a snap on the hip that can connect a ground cord to create a path to electrical ground. 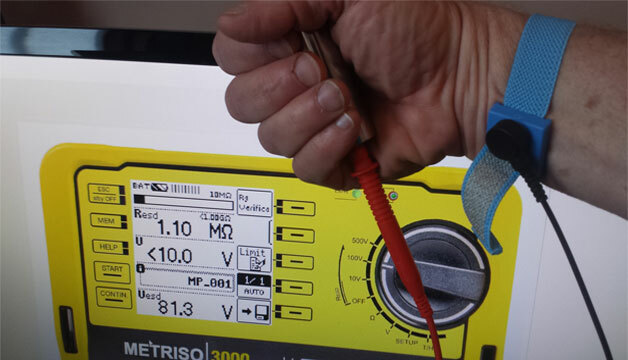 A Groundable Static Control Garment is NOT recommended as the technician’s primary ground source (an ESD wrist strap and or ESD heel straps are still required). These smocks are designed to act as a primary ground source for the technician (they can act as a replacement for a wrist strap). In addition to grounding the technician, they will also help to shield the technician’s clothing from the ESD sensitive product. They are reliant on good skin to smock contact. Hence, they may come with ESD cuffs or snap style cuffs that fit snugly around the users wrist. The Wireless Wrist Strap – Do They Work? We Put Them to the Test! And They FAIL! The wireless wrist strap has been available for over 10 years. We have seen them used in the electronics manufacturing and other assembly applications and have received several inquiries about their performance. 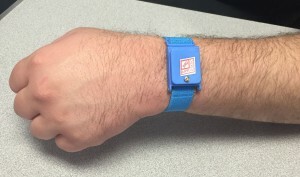 In this blog, we test and report on the effectiveness of the wireless wrist strap. Our results indicate wireless wrist straps fail to ground operators or keep operators sufficiently neutral. Read why the wireless wrist strap system results in a potential nightmare of problems and view the hard data that proves they don’t work. It would be nice to be able to effectively drain the charge from a person without them tethered to a work station with standard wrist straps or other ground connection. 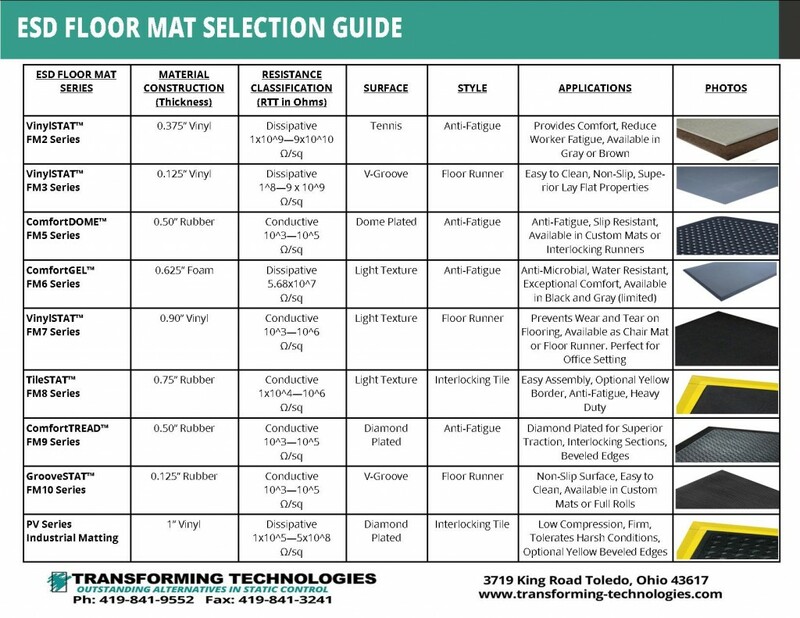 ESD flooring and footwear is an option, however it can require a significant investment for it to be effective. Hence, the dream of the wireless wrist strap. That all sounds wonderful in theory, unfortunately it does not work as advertised. 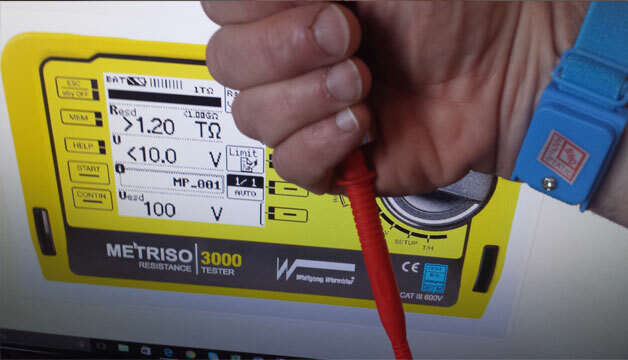 Most companies follow the ANSI/ESD S20.20 standards for their ESD Control Programs which requires human body voltage to be less than 100 volts and the wireless wrist strap does not meet the requirements of the standard. The standard states “All personnel shall be bonded or electrically connected to the grounding/equipotential bonding system when handling ESDS items.” The standard goes on to list the requirement of a resistance between the operator and ground of less than 35 megohms. This requirement seems quite impossible to meet with the wireless wrist strap. But what if you are not tied to the industry standard and just want to make sure that you are not generating excessive voltage that could harm electronic devices or assemblies? The voltage generated and stored on the person is what is important. So let us conduct another measurement that compares the voltage generated on a person that is a: not grounded, b: grounded through a conventional wrist strap/cord system and c: a person wearing the wireless wrist strap. For this test we will use the Warmbier WT5000 walking test instrument. This instrument measures and records the voltage on a person while walking or simply standing. To measure the voltage we held the test electrode on the instrument and repeated the six step walking test described in ANSI/ESD STM97.2 – Voltage Measurement in Combination with a Person. You see that from Figure 1 that the voltage on the person wearing standard shoes on a tile floor and no wrist strap was greater than -500 volts. This voltage is well in excess of the damage thresholds for many devices today. Next we will try the same floor and footwear but the operator will wear a standard wrist strap with coil cord (Figure 2). In this case you should notice that the voltage is minimal. The peak voltage was -1.41 volts and the valley was +0.46 volts. Finally, we test the same floor and footwear with the wireless wrist strap (Figure 3). -100 volts were reached within one second of the test and peak voltages exceeding -500v were reached in less than 10 seconds. So in addition to not being electrically bonded to ground, the wireless wrist strap does not prevent charge build-up or decay charge at a rate that is acceptable for handling electronic devices. It would be nice to be able to handle electronic devices without that bothersome coil cord getting in the way or without having to invest in a flooring and footwear system, however the reality is that a person must be physically and electrically attached to ground to drain charge from their body. Transforming Technologies provides comprehensive knowledge of electrostatic issues, effective solution-oriented products and outstanding, friendly service. Because customer needs periodically include requirements for consultation, training, auditing or verification, we offer Professional ESD Services such as trainings or audits. Please contact us for more information on our professional services and insure that your static control program is as effective and efficient as possible. Find out if your facility has static charge in locations that can be harmful to your manufacturing process. The work includes benchmarking of each step of the production line, measuring electric fields and electromagnetic interference caused by electrostatic discharge. A report is supplied with interpretation of results and assessment of the magnitude of each item found. Additionally, this service can also include a search for ESD induced transient EMI. This can be important in facilities with lots of computer-driven robotics or automated testing. This type of EMI can disturb microprocessor operations resulting in locked up or stopped robots, other robotic unexplained behavior or cause good parts to test bad. Includes a complete static charge audit and detailed review of each step in the manufacturing process. If you prefer, the study can focus on one part of the manufacturing process, for example photolithography. Where problems are identified a selection of choices of solutions are recommended. In addition. The study focuses on identifying the steps required to achieve best practices concerning personnel grounding, garments, equipment grounding, hand tools, chairs, work surfaces and automated handling procedures. A report is supplied with recommended upgrades to the facility intended to improve facility ESD safety. Find out if the ionizers in the process are working properly and if they are correctly designed in so that they can achieve the results required, If the ionizers are in need of maintenance or adjustment you will know it. If ther ionizers can be made to work better, you will receive recommendations. If the ionizers used are the wrong type or if additional ionizers are required, the report will include these facts. Corona ionizers collect material from the environment much like a dust precipitator. That material lowers the efficiency of the ionizer and must be removed. Also as tools and fixtures are moved in the cleanroom, the balance of the ionizer is effected. For both of these reasons and because the control circuitry in the ionizer drifts over time, the ionizers require maintenence. No ESD control program can succeed without the help and cooperation of the production team. 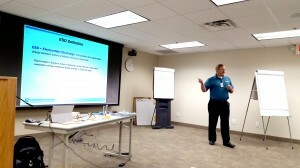 LBL offers a seminar to teach the people manning your production floor about static charge and how the various steps in a control program work. LBL understands the complex issues that arise from being in charge of quality management and safety. LBL will work with senior management to consolidate best the practices and drive standardization across the organization. Wether you are just starting your ESD control program or static discharge has been a main concern for years, LBL understands that every static problem is unique, ranging from the simple to the incredibly complex. Contact LBL to discuss any issues, big or small that you may have.